AMARAVATI: Actor-turned-politician Pawan Kalyan on Tuesday announced that he will contest the April 11 Assembly election in Andhra Pradesh from Gajuwaka and Bhimavaram constituencies. It is to be noted that Pawan Kalyan – a well-known Telugu star – launched his own party Jana Sena few years ago and he has decided to jump into the electoral fray from Gajuwaka and Bhimavaram after an intensive survey in various constituencies. Gajuwaka is in Visakhapatnam district and Bhimavaram in West Godavari. 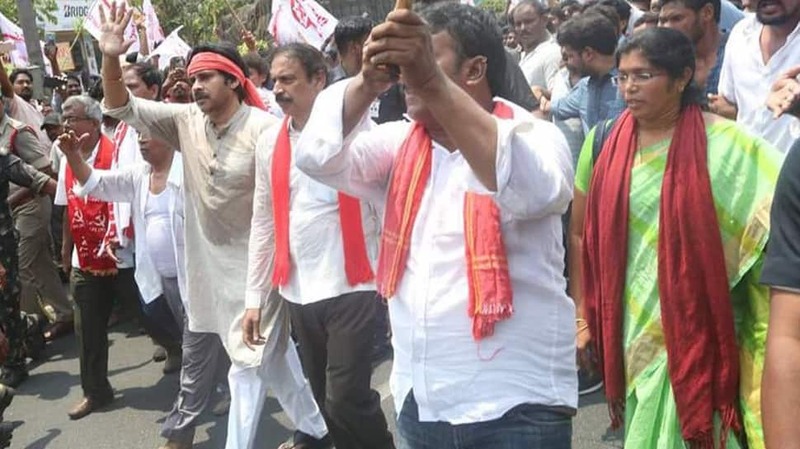 Jana Sena has decided to contest the Lok Sabha and Assembly elections in alliance with the Bahujan Samaj Party, CPI and CPI(M). As part of the seat-sharing agreement, Jana Sena will field its candidates from 140 Assembly and 18 Lok Sabha seats. The party has already announced its candidates for 77 Assembly and nine parliamentary seats. The BSP has decided to contest from three Lok Sabha and 21 seats while the two Left parties will field its candidates from seven Assembly and two Lok Sabha seats. On March 17, Pawan Kalyan had said that he wished to see BSP chief Mayawati as the Prime Minister of India because the country needs a strong leader like her. It is learnt that Mayawati is scheduled to visit Amalapuram on April 3 and Tirupati the next day before going to Hyderabad. The alliance between Jana Sena and BSP would also extend to Lok Sabha elections in Telangana but the two parties are yet to finalise the seat-sharing arrangement. In January, while addressing a massive rally in Amaravati, Pawan Kalyan had expressed confidence that his party will form the next government in Andhra Pradesh because it has the support of weaker and backward sections of the society. The Jana Sena supremo had said that main aim is to politically empower all sections of the society and he has not decided to enter the political arena for money and position.